The video showing the burning alive of the captive Jordanian pilot prompted revulsion around the world. Propaganda!, cried Islam apologists. Don't show it! But behind this outrage is a postmodern ideology that is driving the Islamic State to ever more terror and brutality. If true, we ain't seen nothing yet. This image is not meant as 'propaganda', as an elevator pitch. It's terror, intimidation aimed at breaking the will of anyone who even thinks of resistance. 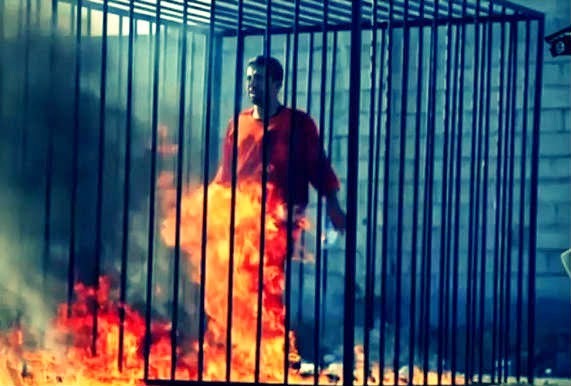 The burning to death in a locked cage of captured Jordanian pilot Muadh al- Kasasbeh by Islamic State was barbarous even by its own brutal standards. The group struggled to justify the live immolation of a Muslim prisoner with the ease it did in previous cases of heinous crimes. In a written fatwa about two weeks before the video, Isis-affiliated clerics cited differences of opinion over the issue among Sunni Islam’s four schools of jurisprudence. In the end, the Isis clerics ruled that immolation is "forbidden in principle" but "permissible in cases of reciprocity". In previous cases, Isis found little difficulty in citing evidence to back the religious legitimacy of its acts. Beheading, crucifixion and hand-lopping did not require much reasoning because these punishments are part of the penal code of countries such as Saudi Arabia. Also, Isis cites isolated incidents described in sacred texts that (contrary to most Muslim clerics) it believes should be followed as rules to justify obscure punishments, including throwing gay people from high buildings. But with its latest action, many believe Isis has alienated previous supporters in the region. Even though some still criticised the pilot’s participation in the US-led bombing campaign in Syria, anger and resentment against Isis defined public opinion in Jordan and beyond, including among them sympathetic individuals such as Abu Sayyaf, a prominent Salafist leader in Jordan who approved of the immolation but not the publicity that accompanied it. One of the most prominent of those jihadi texts is a book called Idarat al-Tawahush, or Management of Savagery, by an anonymous jihadi ideologue who calls himself Abu Bakr Naji. The book, translated by William McCants of the US Brookings Institution in 2006, has been widely distributed on jihadist online forums. But for the first time, Isis members have confirmed that the book is part of the organisation’s curriculum. As part of research for a book I co-wrote, one Isis-affiliated cleric said that Naji’s book is widely read among provisional commanders and some rank-and-file fighters as a way to justify beheadings as not only religiously permissible but recommended by God and Muhammad. Another member gave a list of books and ideologues that influence Isis, including Naji’s book. The Management of Savagery’s greatest contribution lies in its differentiation between the meaning of jihad and other religious tenets. The author argues that the way jihad is taught 'on paper' makes it harder for young mujahideen and Muslims to grasp the true meaning of the concept. "One who previously engaged in jihad knows that it is naught but violence, crudeness, terrorism, [deterrence] and massacring,"Naji writes, as translated by McCants. "I am talking about jihad and fighting, not about Islam and one should not confuse them. He cannot continue to fight and move from one stage to another unless the beginning state contains a stage of massacring the enemy and deterring him." The concept Isis used to justify the massacre of hundreds of Shaitat tribesmen in Deir Ezzor, Syria, in August was tashreed, a word that can be translated as deterrence, as mentioned in the quoted text. "That is the true jihad," said Abu Moussa, an Isis-affiliated religious cleric, echoing Naji’s text. "The layman who learned some of his religion from [mainstream] clerics think of jihad as a fanciful act, conducted far away from him. In reality, jihad is a heavy responsibility and requires toughness." Naji’s book offers practical tips on how to fill the power vacuum left by what he calls the retreating armies of the west and its regional agent regimes, as a result of gradual violence applied by the mujahideen. He says that the defeat of the crusaders in the past was not a result of decisive battles between the Muslim and Christian armies, but was a process of exhaustion and depletion. He argues that the Muslim victory in the 12th-century Battle of Hattin, when crusaders led by the king of Jerusalem, Guy of Lusignan, were defeated by the Muslim army, led by Saladin, was possible only because of previous small-scale skirmishes in a variety of locations. Such small acts, Naji writes, include "hitting a crusader with a stick on his head", a statement echoed by Isis’s spokesman Abu Mohammed al-Adnani in the wake of the air strikes in Syria. Naji says that people think of Muslims at the time of the crusaders as one state, led by Saladin al-Ayubi and Nouradin Zinki, but "the fact is they were small families controlling citadels and fighting jihad against crusaders on a low level, in a hard hitting way. What Zinki and Ayubi did was to bring together those small blocs into one big organisation but the largest role was played by those small blocs." According to Isis, violence has to be steady and escalatory to continue to shock and deter. Random acts of violence are not enough in this context. Brutality has to be ever more savage, creative and shocking. So if the immolation of the pilot is more savage than previous murders, Isis will undoubtedly be searching for an even more savage method to carry out its violent punishments. It is important to emphasise that Isis increases the level of its savagery at critical moments, rather than ad hoc. The Jordanian capture provided a huge opportunity for it to humiliate the international coalition and send a strong message to Muslim countries participating in it. Isis recognised that the act would alienate some Muslims, but believes it will deter many more. What Isis gains from violence, it calculates, trumps any losses in popularity. This strategy was similar to the one followed by the group’s founding father, Abu Musab al-Zarqawi, himself a Jordanian, when he set the precedent of filming the slaughtering of an American captive, Nick Berg, in 2004. The killing, which the CIA said was carried out by al-Zarqawi, won him the nickname “the Sheikh of the Slaughterers” by fellow jihadists. Savagery is at the core of Isis ideology. But it is crucial not to play down that brutal acts have to be justified through sharia texts. Islamic fundamentalism is Isis’s ideology, so to speak, and every act has to be grounded in religious traditions. Muslim clerics who issue a "letter to al-Baghdadi" (source) or a lengthy fatwa to delegitimise Isis miss the mark unless they understand the invigorating nature of this violent ideology. While Isis uses manuals such as Naji’s book, it references religious texts and stories. Muslim clerics should recognise that theoretical fatwas cannot sufficiently counter what I call 'kinetic' sharia, consisting of stories and actions carried out by authoritative Muslim figures in early Islam, on which Isis relies heavily to justify its ideology. Statements such as "this hadith is weak" or "it is not permissible to kill prisoners of war" can be backed by religious texts, but how early Muslim leaders acted is similarly powerful, if not more persuasive. The dilemma is that mainstream clerics sometimes steer clear of engaging in such stories because that has cross-sectarian implications. For example, critiquing immolation, killing captives and throwing people off high buildings risks arguing against Islamic figures at the core of the Sunni-Shia divide. Isis members claim these three acts were either carried out, or approved, by the first Muslim caliph, Abu Bakr, whom Shia consider an illegitimate leader – although many Sunni clerics dispute the references to immolation. Ahmed al-Tayeb, the sheikh of al-Azhar, the centre of Sunni learning, issued a generic statement addressing Islamic teachings about the treatment of captives and then called for "crucifying and chopping the hands and feet" of Isis members. Islamic traditions are filled with stories of mercy and tolerance. But it is not enough to tell these stories in isolation from other dark chapters in Islamic history that feed groups such as Isis. Isis uses these stories, combined with ideas and concepts accepted by the mainstream, as part of an ideology and a political project in the making. Muslim clerics speak in the realm of theory; Isis practises through stories and action. What the group does is to match its practices with the 'practical' history of Islam, even though many rightly view these practices as contradictory to Islamic teachings. The genius of Isis is that it makes people compare between its acts and those of early Muslims, rather than between its practices and the jihad 'on paper'. Read in this context also "From the Mouth of Babes: "Islamic State is Right". Hassan Hassan is an analyst at the Delma Institute, a research centre in Abu Dhabi. He is co-author, with Michael Weiss, of Isis: Inside the Army of Terror, to be published this month in New York by Regan Arts. ISIS are a cancer in Islam, not because they go against Islamic scripture, but because they draw on it so effectively.